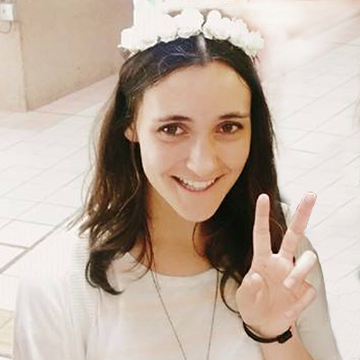 Olga Janzen is an exchange student at Soochow University in Taipei, Taiwan. Currently she is enrolled at Hanze University of Applied Science in Groningen, Netherlands and pursuing her Bachelor's degree in International Business. Growing up in Germany with a Russian background, she spent a gap-year working in England where she decided that she wants to gain life experiences beyond the borders of Germany. Before coming to Taiwan she spent half a year in South Africa doing an internship in Communication, Marketing and Event. Accompanying her Bachelor's degree, she is also participating in the Honours program at her university in the Netherlands, where she is getting additional experiences to further develop herself and to grow as a business professional. In Taiwan she is mostly focusing on cultural courses and experiences and after her graduation she is considering to return to Taiwan to learn Chinese or continuing her studies by applying for a Master in Sustainability. This Talk is Sponsored by Johnnie Walker The Keep Walking Fund. Production assisted by IOH Helper Yu-Chuan Cheng. Edited by Michael Chuang, Lily Lin. Olga is an exchange student from the Netherlands. She was born in Russia, grew up in Germany, while also spending a year in England learning English. While attending Hanze University of Applied Science (majoring in international business), in her third year she decided to participate in the overseas exchange program that her school provided. In the end, after weighing all of her options, Olga decided to come to Soochow University in Taiwan, citing that Soochow provided a much larger pool of courses for her to choose from. She specifically stated that because international students studying in Soochow didn’t have to follow a specific curriculum, which allowed her complete freedom in choosing her own courses to study, thus making Soochow the perfect choice for her. Olga describes her life in Taiwan as fun yet challenging at the same time. The people here are nice and friendly, yet Olga doesn’t speak a single word of Chinese, so communication is always a problem for her. Besides that, she enjoys all of the courses the university offers, with most of her courses taught in English. In this presentation, she specifically talks about an English speaking course that was more than what she imagined. In most people’s minds, speaking classes might just be about reading sentences out loud, trying to pronounce difficult vocabulary. In contrast, the speaking class Olga attended had a more hands-on approach. She had to learn how to speak to many people under several different circumstances while trying to persuade them to believe and understand her opinion. Besides many interesting courses, Soochow also offers many afterschool activity clubs. Olga participated in the Japanese Tea Ceremony Club, which teaches students many ways of behavior during tea ceremonies. She also joined the dance club, where the instructor didn’t speak English, yet they still managed to communicate, resulting in Olga mastering the dance moves with the help of her fellow peers. At the end of her presentation, Olga talks about how living and learning in Taiwan has changes her view and perspective about life. Amidst the culture shock of not being able to understand a single word of Chinese, Olga has learned that she can still communicate and learn in this environment. Also, she recommends foreign students who have a longing to exchange to Taiwan to be brave in their surroundings, and to always remember to have fun, no matter where they are. Q1. What is the most special thing about Soochow University for you? Q2. What is the advantage about exchanging to Soochow University? Q3. 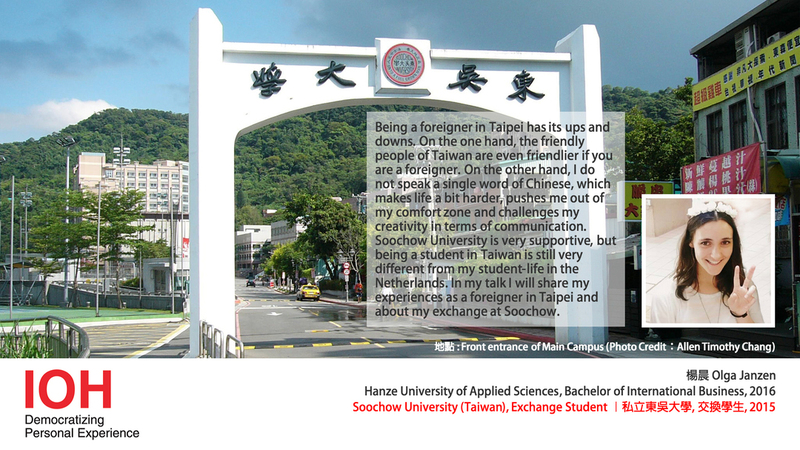 How did the exchange experiences in Soochow University influence you? Q4. Whom would you recommend to exchange to Soochow University?